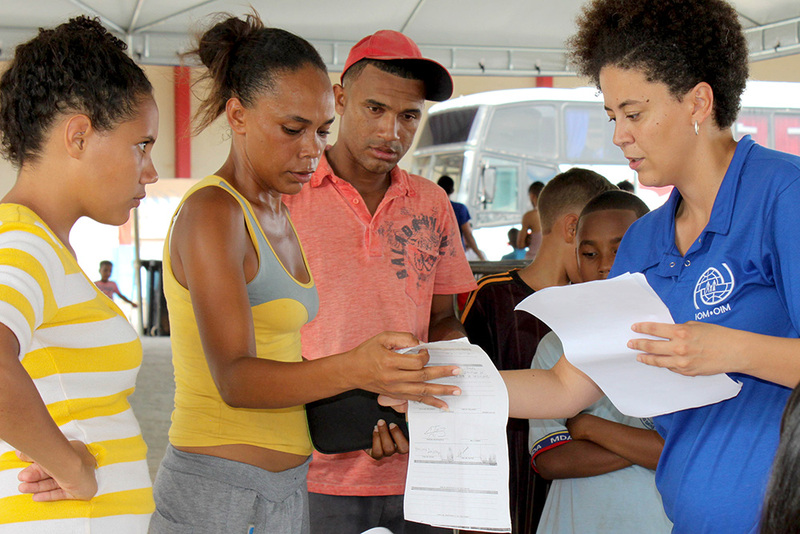 Boa Vista - IOM, the UN Migration Agency is today (04/05) supporting the relocation of 236 Venezuelans from the city of Boa Vista in the State of Roraima on the border with Venezuela, to the cities of Manaus and Sao Paulo, Brazil. This is the second group to be relocated under the Relocation Strategy led by the Government of Brazil and supported by IOM and other UN Agencies including UNHCR and UNFPA. The initiative seeks to help Venezuelans find opportunities in other Brazil cities. The first group of 265 Venezuelans was relocated to the cities of Sao Paulo and Cuiaba on 4 and 6 April respectively. Today’s group is comprised of 34 families (152 individuals including 74 children) who will relocate to Manaus, and 84 individuals to Sao Paulo. The Venezuelans will be in six temporary sites (three in Manaus and three in Sao Paulo) where the local governments will provide them with accommodation, food, healthcare and labour market orientation. They will also receive support from the civil society and UN Agencies. The State of Roraima has registered the highest number of Venezuelans who have entered Brazil recently. Up to April, according to the Government, approximately 43,000 Venezuelans have applied for the regularization of their migration status in Brazil. 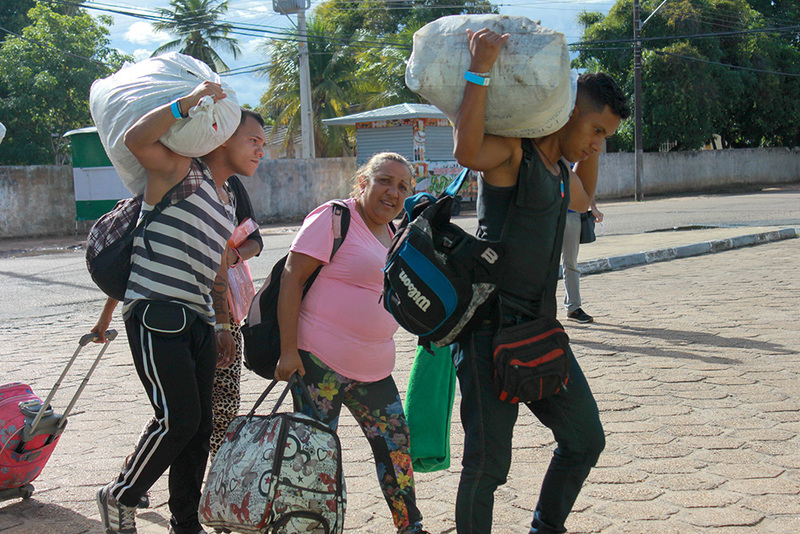 According to the latest IOM DTM report, of 3,500 Venezuelans interviewed in the cities of Boa Vista, Roriama’s capital and Pacaraima, border city with Venezuela, 65 per cent are willing to move to other cities in Brazil. Viviane Esse, Government Representative (Casa Civil), said that the collaboration between the Government and the UN agencies involved in the relocation strategy, including IOM, has been crucial to implement the relocation strategy. Anderson Martínez, a Venezuelan who will be relocated to Sao Paulo, said that his expectations are focused on finding a job to send money to his children in Venezuela and also learn the language. “If, in the future, the situation in my country improves, I will go back; otherwise I will bring my children to live in Brazil with me,” said Martínez. Stephane Rostiaux, IOM Chief of Mission in Brazil, explained that IOM has been monitoring the situation of Venezuelans in the State of Roraima together with the Brazilian authorities since 2016. “Through our office in Boa Vista, we have been providing support to the local government in the registration and documentation of Venezuelan citizens as well as in the reception of the flows and in the implementation of projects to allow their integration,” Rostiaux said. According to a recent IOM report, Brazil is one several new destinations for Venezuelans along with Colombia, Chile, Argentina, Ecuador, Peru and Uruguay. Venezuelan migration has significantly increased in the last two years. Globally, the number of Venezuelans abroad rose from 700,000 to more than 1,500,000 between 2015 and 2017, which represents an increase of nearly 110 per cent. In South America, the number of Venezuelans rose from 89,000 in 2015 to 900,000 in 2017, an increase of approximately 900 per cent. There has also been a diversification of countries of destination, with Colombia, Chile, Argentina, Ecuador, Brazil, Peru and Uruguay being some of the new destinations for Venezuelans. The diversity of routes used by Venezuelans shows a dynamic and changing mobility. Apart from the air route, the land and maritime routes have recently become more significant. In the case of neighbouring Caribbean islands, such as Aruba, Bonaire, Curaçao, and the Republic of Trinidad and Tobago, the short distances facilitate the maritime mobility. In the case of Colombia and Brazil, the main part of the movements is by land across the border. In Brazil, the highest number of entries by Venezuelans is registered in the state of Roraima. In Colombia, the largest number is registered in the city of Cucuta. Numerous entries by Venezuelan nationals into Ecuador are also registered through Rumichaca; into Peru through Tumbes – border with Ecuador; and into Chile through Tacna – border with Peru, to give some examples. Venezuelans are leaving their country for different reasons, and when asked, they mention multiple causes related to political factors, socioeconomic needs, the search for job opportunities and the situation of insecurity and violence. The Governments of host countries determine their status (refuge, temporary/permanent residence, temporary protection, etc.). Host countries in South America regularise a large part of Venezuelans through the application of general or specific migration instruments. By means of these regularisation mechanisms, 400,000 temporary and permanent residences have been granted. IOM commends the ongoing efforts of the Governments in the South American region and encourages the countries to continue looking for channels to regularise Venezuelan migrants, thus enabling their protection and access to their rights, as well as preventing traffickers from acting. Indigenous populations, women, unaccompanied children and adolescents have been identified as highly vulnerable groups among the migrant population. Migrants face vulnerabilities particularly related to health and are at risk of human trafficking or smuggling. They also face difficulties related to labour market insertion. In addition, a significant part of Venezuelan migrants have a good level of education and intend to continue their studies in the host countries (Argentina), get well remunerated jobs or set up their own businesses (Argentina, Uruguay, Chile). However, some of them are exploited, in part, due to the lack of skills recognition, their legal status, among other reasons. IOM is implementing different initiatives, including: monitoring and profiling of migration flows at the regional and national levels through the implementation of tools such as of the Displacement Tracking Matrix (DTM); training in Camp Coordination and Camp Management (CCCM); establishment of transit centres and temporary shelters; direct assistance to migrants, including transportation and food, as well as provision of information related to regularisation. IOM works closely with the South American governments, other UN Agencies (UNHCR, UNFPA, WFP) and other civil society organisations.